Meghna Gulzar’s Guilty has the tough job of dramatizing the Aarushi Talwar case without veering into sensationalism and heavy-handedness. It’s an extraordinary feat that Gulzar keeps the finger-wagging at bay, and delivers a sharply scripted and angry look at mishandling of the case. As expected, names are changed and certain details are elided to provide more narrative potency, so Hemraj, Nupur, and Dinesh Talwar are now Nutan Tandon (Konkona Sen Sharma) and Rajesh Tandon (Neeraj Kabi), and Khempal. There’s also Inspector Ashwin Kumar (Irrfan Khan) who steps in as the chief investigator on the case, whose cool and cynical wit often breaks the tension during the dark moments of the film. The narrative is focused like a procedural drama, which is a good touch because it lays out all the details for the audience to pore over. Gulzar also employs a Rashomon-like structure when it comes to reenactments of the crime from the POV of the initial faulty police reports, the testimonies of the likely killers, and from the parents. These sections of the film are excellent because the audience becomes the detective alongside Ashwin, who’s leaning towards the other servants as the killers. It’s interesting to see how minute details like the duplicate terrace key or the demeanour of the parents become so crucial in the conviction. Much like Chaitanya Tamahe’s Court, Gulzar and writer Vishal Bhardwaj explore the corruption and high-level bureaucracy of the Indian justice system. When the case gets taken away from Ashwin, the film gains its urgency as we see usual steadfast witnesses being intimidated, evidence being mishandled, and CDI superiors shuffling the case along for years. It makes you feel the frustration of the parents, and Ashwin, because convicting them on the basis of circumstantial evidence feels so heartbreaking. When the film culminates in both investigation teams presenting their evidence with dark humour seeping out, you can’t help but also incredulously laugh at the evidence presented. This section, although darkly hilarious, feels a bit forced and the conclusion loses all of the riveting force that kept us hooked by rushing through the verdict. That’s the only misstep of the film, which is thoroughly engaging beforehand. The performances in the film are stellar, especially from Sen Sharma and Kabi, who capture that grief and frustration in their expressions and small gestures. When Kabi howls like a wounded animal in one reenactment, you can’t help but come on board with the family’s side of the story. Khan is terrific as Ashwin, and conveys that frustration with just one sigh or one wisecracking joke. The supporting cast of Shishir Sharma as the new head of CDI, to the trio of actors playing the servants, who bring out that chilling menace. Tabu also has a special appearance as Ashwin’s wife, but she only serves to colour his personal life as his annoyed ex-wife. 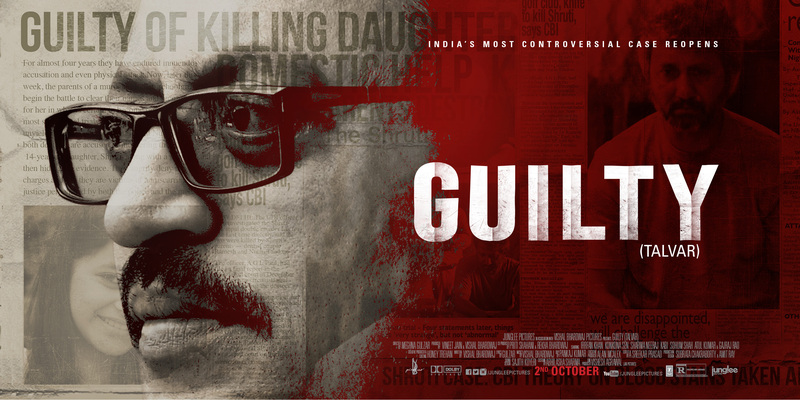 Guilty is a painstakingly detailed account of the Talwar double-murders and the horrifying mishandling of justice that continues to haunt long after its verdict. 16 queries in 1.046 seconds.